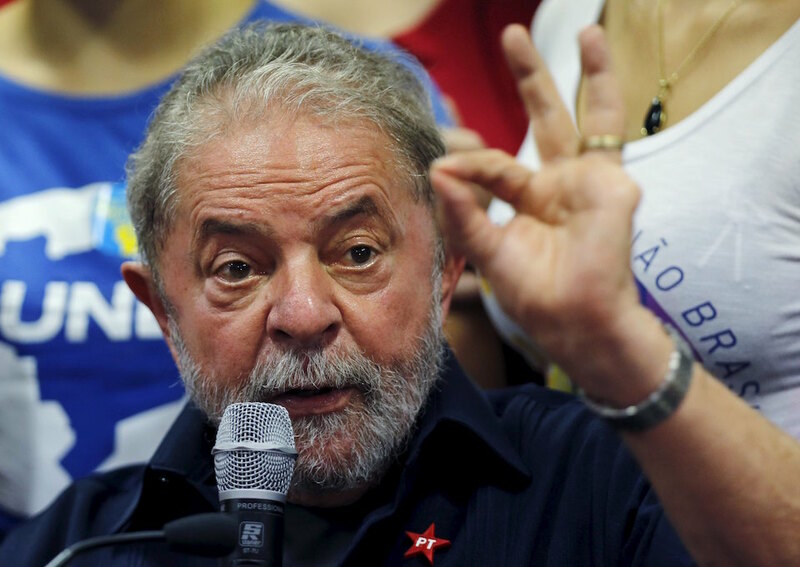 SAO PAULO/BRASILIA (Reuters) – Former Brazilian President Luiz Inacio Lula da Silva was briefly detained for questioning on Friday, March 4, in a federal investigation of a vast corruption scheme, fanning a political crisis that threatens to topple his successor, President Dilma Rousseff. Lula’s questioning in police custody was the highest profile development in a two-year-old graft probe centred on the state oil company Petrobras <PETR4.SA>, which has rocked Brazil’s political and business establishment and deepened the worst recession in decades in Latin America’s biggest economy. The investigation threatens to tarnish the legacy of Brazil’s most powerful politician, whose humble roots and anti-poverty programs made him a folk hero, by putting a legal spotlight on how his left-leaning Workers’ Party consolidated its position since rising to power 13 years ago. Police picked up Lula at his home on the outskirts of Sao Paulo and released him after three hours of questioning. They said evidence suggested Lula had received illicit benefits from kickbacks at the oil company, Petrobras, in the form of payments and luxury real estate. The evidence against the former president brought the graft investigation closer to his protege Rousseff. She is already fighting off impeachment for allegedly breaking budget rules, weakening her efforts to pull the economy out of recession. Rousseff expressed her disagreement with the police taking her mentor into custody, saying it was “unnecessary” after his voluntary testimony. But she repeated her backing for institutions investigating corruption and said the probe must continue until those responsible were punished. News of Lula’s brief detention sparked a rally in Brazilian assets as traders bet that the political upheaval could empower a more market-friendly coalition. The real currency <BRL=> rose over 3 percent against the U.S. dollar before settling to a 1 percent gain. The Bovespa stock index <.BVSP> rose 4 percent, led by a 10 percent surge for the state oil giant Petrobras, formally known as Petroleo Brasileiro SA. “Ex-president Lula, besides being party leader, was the one ultimately responsible for the decision on who would be the directors at Petrobras and was one of the main beneficiaries of these crimes,” police said in a statement on his detention. Lula was indignant, slamming investigators for “disrespecting democracy” and running what he called a media circus rather than a serious investigation. He told supporters at Workers’ Party headquarters he had already answered the questions that police asked him on Friday and reiterated that he was not the owner of luxury real estate that investigators have suggested he received as bribes. “This is not justice, this is violence,” he said. Underscoring the deep political passions surrounding the former president, TV images from the street outside Lula’s home on Friday showed his supporters clad in red shirts exchanging chants, insults and even blows with opponents. Dozens of police arrived to break up the altercations, clearing the street by force. Pro-Lula protesters also gathered in a noisy protest outside federal police offices at a Sao Paulo airport where he was taken for questioning. As the founder and figurehead of his party, Lula’s image has been central to huge street protests over the past year, both for and against Rousseff’s impeachment, and powerful unions have marched repeatedly in his name. A presidential aide who had not been authorized to comment publicly called the accusations against Lula a “turning point” in a long-simmering political crisis. “This breaks with standard procedure. If they do not quickly present concrete proof against Lula, there is going to be violence in the streets. It could be a real war,” the aide said. Lula, 70, was a model for a wave of leftist presidents in Latin America as his government coupled healthy economic growth with popular social programs that lifted more than 30 million people out of poverty during his presidency from 2003 to 2010. Yet investigators say much of the corruption at Petrobras happened during that period. On Friday, they called him and Rousseff the chief political beneficiaries of a scheme to fund Worker’s Party campaigns with bribe money. In an online survey conducted on Friday by pollster Ipsos, 97 percent of respondents already knew of Lula’s interrogation. One in four said his errors could not compare with the good things he had done for the country, while half disagreed. Federal prosecutors who ordered Friday’s raids said there was evidence that the former president personally received funds from the graft scheme at Petrobras through work on a luxury beachside penthouse and a country home. Despite Lula’s denials, prosecutors say doormen, OAS engineers and third-party contractors all said the condo in Guarujá, along with at least 1 million reais (£188,026) in improvements and furnishings, was intended for his family. Investigators also say Lula acquired two country estates in Atibaia worth 1.5 million reais, between 2010 and 2014, from businessman José Carlos Bumlai and builders Odebrecht and OAS. Odebrecht representatives said the company was collaborating with a search and seizure operation at its headquarters in Sao Paulo on Friday. OAS declined to comment. “The suspicion is that the improvements and the properties are bribes derived from the illegal gains made by OAS in the Petrobras graft scheme,” the prosecutors’ statement said. Prosecutors are also investigating payments to Lula by companies involved in the Petrobras scandal that were treated officially as donations and fees for speaking appearances. Police said they carried out dozens of search and arrest warrants in the latest round of the investigation named Operation Carwash, after the small-time money laundering investigation that spawned the probe. Some 200 police and 30 auditors from the federal tax office took part. Brazilian media reported on Thursday that ruling party Senator Delcidio Amaral, a major legislative ally for Rousseff before he was arrested in November, allegedly tied the president and Lula to the scandal engulfing Petrobras in a 400-page plea bargain made with prosecutors. In a news conference on Friday, Rousseff denied details of his reported testimony, saying the allegations lacked credibility and were aimed at doing her political damage. The president’s opponents in Congress are seeking to impeach her on the grounds that she deliberately broke budgetary laws to boost government spending as she ran for re-election in 2014. BRASILIA (Reuters) – The implication of Brazil’s ex-president Luiz Inacio Lula da Silva in a graft scandal at state oil firm Petrobras has reignited opposition hopes of unseating his successor Dilma Rousseff and increased the risk she may not finish her term. The federal police’s decision to take Lula in for questioning on Friday raised the temperature of Brazil’s political crisis on the streets, with demonstrators for and against the ruling Workers’ Party clashing outside his home in the outskirts of Sao Paulo. Rousseff’s opponents now expect a larger turnout for a national protest on March 13 to rally support for their efforts to impeach the president or get her 2014 re-election overturned. The main opposition party, the Brazilian Social Democracy Party (PSDB), has asked Congress to impeach Rousseff and said it plans to add accusations made by prosecutors that Rousseff benefited from the Petrobras bribes and political kickbacks. Expectations that Rousseff might fall from power, ushering in changes in economic policy that pull Brazil from its worst recession in decades, drove Brazil’s stock market and currency to the highest in at least six months. For a second day in a row, Rousseff called an emergency meeting of her political advisors to limit the damage from the sprawling investigation, a presidential aide said. On Thursday, media reports that a Workers’ Party senator had linked her to corruption in a plea bargain with prosecutors had sent shockwaves through the government. Rousseff’s political fortunes slumped despite her aides having grown increasingly confident that she had marshalled the support in Congress to defeat the impeachment process. “The risk of impeachment was dead and buried but it has come back with force,” said the Rousseff aide, who requested anonymity because of the delicate situation. “Forget reforms. Brazil is paralysed,” the aide said, downplaying any prospect of advancing fiscal and pension reforms to plug a massive fiscal deficit. The reforms were regarded as important to bolstering flagging investor confidence in an economy that shrank 3.8 percent last year. Prosecutors who ordered Friday’s raids on Lula’s home and offices said they had evidence the former president had enriched himself and financed election campaigns with money skimmed from Petrobras contracts by Brazil’s largest engineering firms. Lula and Rousseff both gained politically from the corruption scheme, they said. If confirmed, Thursday’s reports of a plea bargain deal by Senator Delcidio Amaral would bolster an investigation by the Supreme Electoral Court (TSE) that threatens to annul Rousseff’s 2014 victory on the grounds it was funded using illicit funds. Adding to Rousseff’s woes, the strategist behind her 2010 and 2014 victories, João Santana, was arrested last week on suspicion that he was paid by Odebrecht engineering conglomerate with funds from the Petrobras graft scheme. 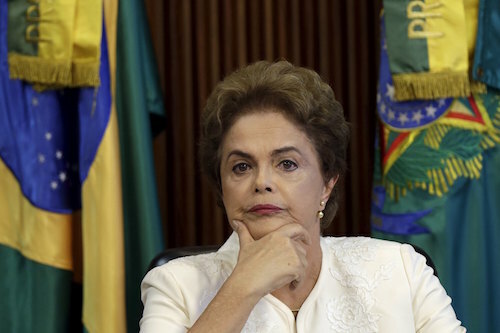 The spread of the Petrobras scandal to the presidential palace will put her coalition allies in a difficult position. Her main ally, the Brazilian Democratic Movement Party (PDMB), appears to be already positioning itself for an end to the era of Workers’ Party dominance that began with Lula’s election in 2002. The centrist party plans to field its own candidate in 2018. The split could now happen earlier. The smaller Brazilian Socialist Party (PSB), a former ally that had taken a neutral stance, announced on Friday it was moving to the opposition. “The immediate consequence of the latest events is that there will be more pressure inside the party to abandon ship and break with the government,” said an aide to Vice President Michel Temer, leader of the party that has six ministers in Rousseff’s cabinet. The PMDB has its convention in Brasilia on March 12 where factions in favour of joining the opposition will voice their support for the impeachment of Rousseff, which would put their leader Temer in the presidential seat.